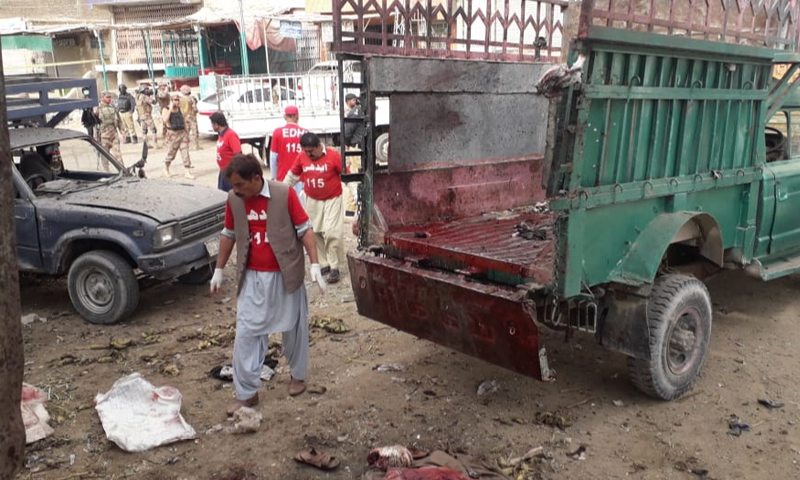 At least 16 people were killed and over two dozen others injured in a blast that targeted members of the Hazara community in Quetta's Hazarganji area on Friday morning. Deputy Inspector General (DIG) Abdul Razzaq Cheema confirmed the death toll to DawnNewsTV and that the blast was targeted at the ethnic community. "The attack took place in a [green grocer's] shop. An Improvised Explosive Device (IED) was planted in a gunny sack filled with potatoes. Whether it was timed or remote-controlled, our experts will tell. Right now they are investigating," DIG Cheema said. "We are giving our attention to the wounded at this time," he said. They have been shifted to Bolan Medical Complex for treatment, and an emergency has been declared in hospitals in the city. Balochistan Chief Minister Jam Kamal strongly condemned the attack. He assured that the elements involved in the attack and those leading them would be proceeded against, and directed the provision of the best medical treatment to the wounded. Prime Minister Imran Khan also condemned the blast and sought an inquiry report into the attack, Radio Pakistan reported.